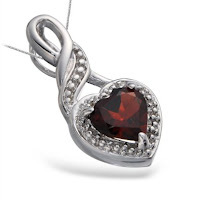 Amazon has a beautiful 1 CT Garnet Heart Pendant In Sterling Silver Necklace for $19.99! This would make a great Anniversary, Birthday, or Christmas gift. Plus it it eligible for FREE shipping on orders over $25.